Thematic study on the rights of persons with disabilities under article 11 of the Convention on the Rights of Persons with Disabilities, on situations of risk and humanitarian emergencies, Human Rights Council, Thirty-first session, 30 November, 2015. Charter on Inclusion of Persons with Disabilities in Humanitarian Action. Persons with disabilities, when compared to the general population, face higher risks in conflict situations and natural disasters. Research shows that the mortality rate among persons with disabilities tends to be two to four times higher than among the general population, as demonstrated in cases such as the 2011 Japan earthquake and tsunami and hurricane Katrina in the USA. Moreover, for every person who dies during a disaster, it is estimated that three people sustain an injury, many causing long-term disabilities. To compound matters, persons with disabilities are disproportionately more likely to be left behind in emergency responses and to fail to benefit from humanitarian services due to ability range of environmental, physical and social barriers. A recent study has confirmed that three-quarters of persons with disabilities do not have adequate access to basic assistance, such as water, shelter or food, in a crisis situation. Half of the persons with disabilities being surveyed also reported no access to disability-specific services, such as rehabilitation or assistive devices . Persons with disabilities are a unique resource of knowledge and experience, which is often overlooked, to help build resilient societies and communities. A barrier-free environment enables full and equal participation in society by all, regardless of age, gender or disability status. The newly adopted international agreement, the Sendai Framework for Disaster Risk Reduction 2015-2030, set the stage to call for actions to meaningfully engage persons with disabilities in all stages of disaster risk reduction and responses, as well as for investment in accessibility, in both the physical environment and information and communication sectors, and ensuring that disability disaggregated data are in place for implementation, monitoring and evaluation of the Sendai Framework. 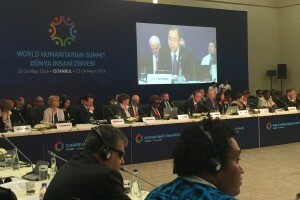 The first-ever World Humanitarian Summit (WHS), set to take place in Istanbul, Turkey on 23-24 May 2016, provides a timely opportunity to build on the progress made in Sendai and ensure that the Sendai Framework, together with other important international agreements such as the 2030 Agenda, are effectively and efficiently implemented on the ground. On 22 May, a UNDESA/DSPD Public Forum on Disability Inclusive Humanitarian Action will be organized in Istanbul to further explore existing challenges and opportunities faced by persons with disabilities in crises and emergencies, to share experiences and good practices, and to discuss the next steps in advancing disability inclusive humanitarian action. The Secretariat for the Convention on the Rights of Persons with Disabilities of UNDESA/DSPD is also working closely with the Secretariat of WHS, Member States, UN agencies and the civil society in support of a Special Event on Making Humanitarian Action Work for Persons with Disabilities during the Summit. “NO-ONE LEFT BEHIND” Protecting human rights in humanitarian crises. A side event of the WHS organized by OHCHR on Monday, 23 May, 8:30-10:00 a.m., Rumeli 7 room, at LKCC building, Istanbul, Turkey. Saving lives, preventing suffering and building resilience, Department for International Development, UK, 2011. Report from Global Consultation on Disability in humanitarian contexts, Handicap International, 2015. Statement on disability inclusion for the World Humanitarian Summit, Committee on the Rights of Persons with Disabilities. Working with persons with disabilities, United Nations High Commissioner for Refugees (UNHCR), 2011. Joint IASG statement on Article 11 of the CRPD, 2015. World Humanitarian Data and Trends 2015, OCHA, 2015.